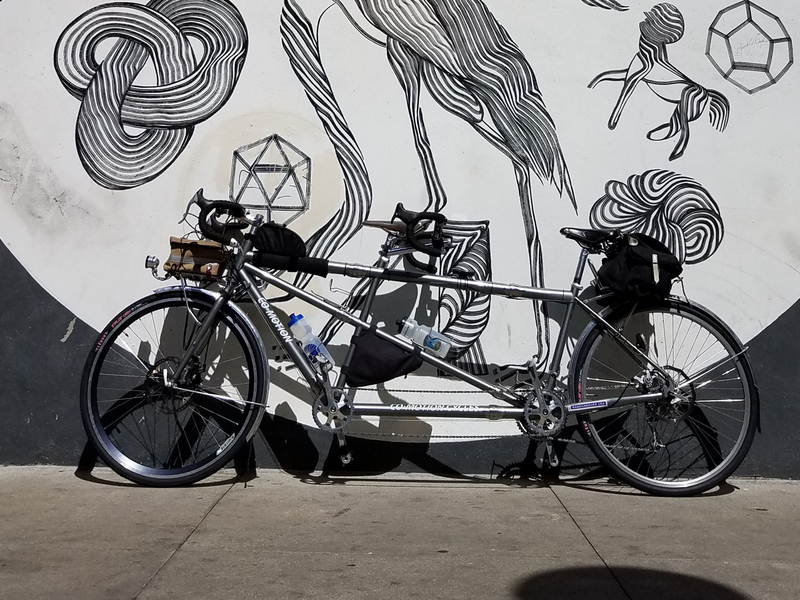 This is the first of three posts on our recent unsupported tandem tour. Watch this space on Wednesday and Friday for the rest! 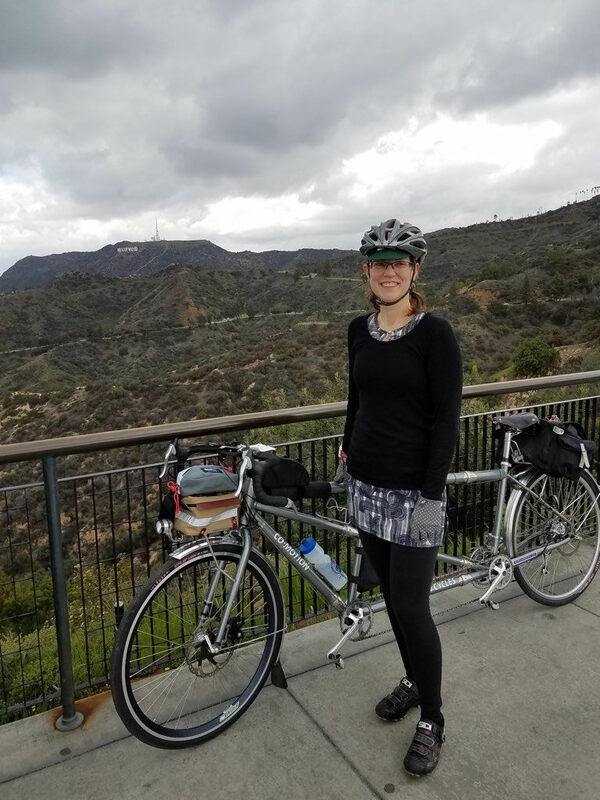 Mary and I have gone on one- and two-week unsupported tandem tours for awhile now, starting in 2005 when we rode a grueling 800 hilly miles over seven days with friends from home in D.C. to Niagara Falls. In the last few years we’ve been taking two-week trips in July to the West, with three trips to the Rockies, one to Idaho & Montana, and one to the Sierras and Cascades. The common theme: elevation! We pointed our front wheel towards the high peaks to escape the summer heat both in D.C. and the West. Our most recent trip was a departure of sorts, then. 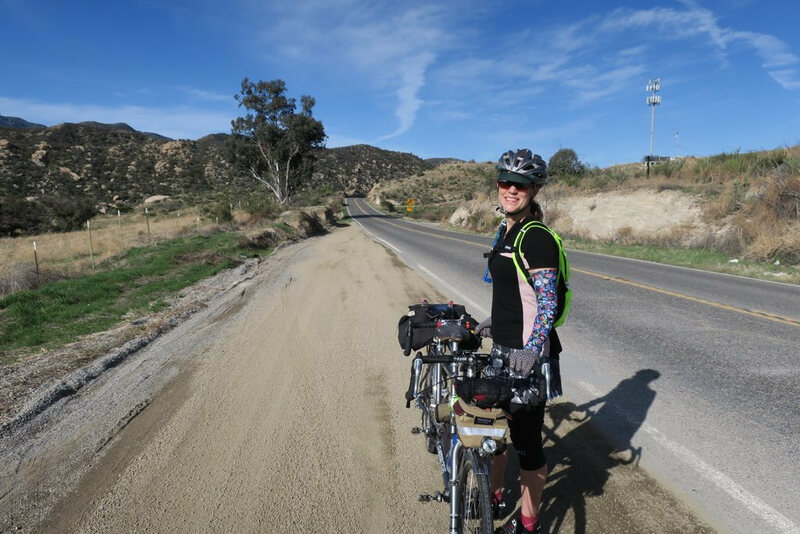 Instead of waiting until July, we decided to head out to California and take advantage of spring’s cool winds to ride across the desert from Los Angeles to Phoenix. It wasn’t the longest or the hilliest trip, but it might have been the most emotion-filled tour we’ve taken. and best of all, a break from the East Coast cold. We got a taste of the good life in California. We stopped for great espresso. We savored the days together as we marveled at the stunning desert vistas. We rode with fellow travelers. By the time we got home 10 days later, we were wrung out, physically and emotionally, happily tired and glad for our own bed. Still, more than a month later, I’m asking myself, why was this such a memorable trip? Maybe writing about it will help me discover the answer. A bit of good fortune come our way this spring: time off. My work requires everyone to clear out leftover annual vacation by March 31. I had almost a week to use or lose. Mary and I had sat down over the Christmas holidays and looked at the map, wondering where we could stage a five-day self-supported tandem tour in the West that wasn’t cold. That took out the high elevations. We had a good trip previously to northern California, and thought the south might be worth exploring. That led us to look at Los Angeles as a starting point. Los Angeles doesn’t rise quickly to one’s mind as a cycling destination, I know! But it checked off a number of boxes. Mary’s sister lives there with her family. A family meetup is always a good thing, especially when relatives live on the opposite coast and visits are not easy. Next, we wanted to ride with the active tandem couple Patrick Loo and his wife Delphine, known as #tandemlosangeles on Instagram. I started following them last year. They made it look like fun to wander through the L.A. neighborhoods and along the ocean. We contacted them and they encouraged us to come visit. Next, we had to figure out our end point. These days we like point-to-point tours. The shipping company Bikeflights.com makes it easy to ship our tandem airline cases to our end point, where we can pack up and fly home. Google Maps revealed Phoenix was about 500 miles away, and we could cover about half the trip on the Adventure Cycling Association’s Southern Tier coast-to-coast ride that goes through Phoenix. To complete the circle, my sister lives in Phoenix with her husband, along with their two grown kids in the region. Another family meetup was possible and we could get there by bike, riding across the desert without fear of being incinerated by the summer heat. Phoenix is also home to one of cycling’s top gentlemen, Erick Cedeno, the famous Bicycle Nomad, who runs his cafe in downtown Phoenix. That was a natural destination. Adding to the lure was the fact that both cities are served by Southwest Airlines, our preference because of the two-free-bags luggage policy. Finally, there was an intangible. Dear friends Jerry S. and Carolyn C. picked late March to leave Washington for good, to bike tour around the world, before settling somewhere else. The desert seemed like a good place to go and pedal our broken hearts out. Such was born the Sister-to-Sister Tour. Our S&S-coupled Co-Motion Java Tandem snugly packed, we arrived late and groggy at LAX on a rainy night on March 14. I didn’t see any celebrities in the terminal, sadly. Maybe I wasn’t looking hard enough. 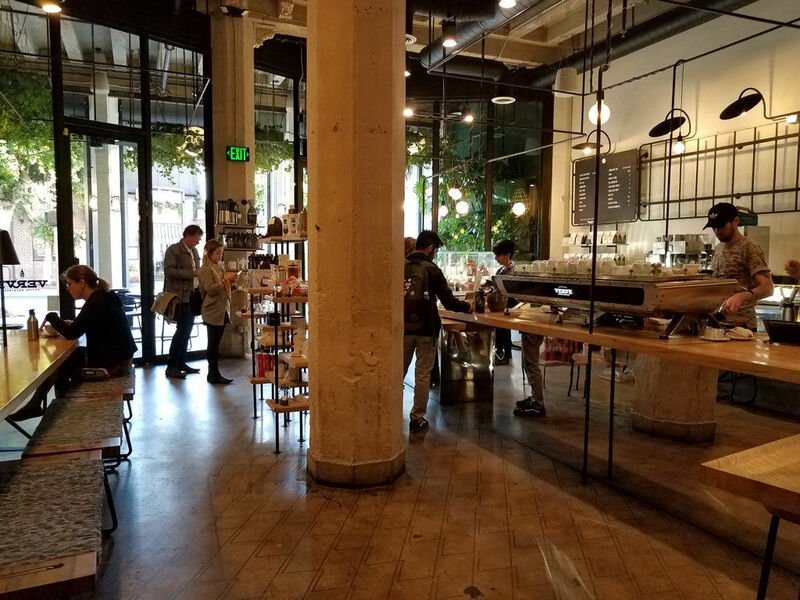 We always take the first day on a trip to find good coffee to shake off the disorientation, then build up the bike, and go ride to more good coffee. We stayed in a downtown hotel, the upscale J.W. Marriott, which had surprisingly good rates. Downtown L.A. is undergoing a renovation amidst decaying old buildings. Up early due to the time change on Thursday, March 15, we walked to the Verve Coffee Roasters retail shop on South Spring Street for heavenly espresso drinks (for me) and an Americano for Mary. Following a couple of hours of bolt turning and tire pumping back at the hotel, the mighty Java emerged from the cases in fine shape, ready to roll. We stopped for lunch at Whole Foods, also downtown, and for another coffee at Verve. Then we rode a few miles down Figueroa to meet Mary’s sister Emily at her office at USC. 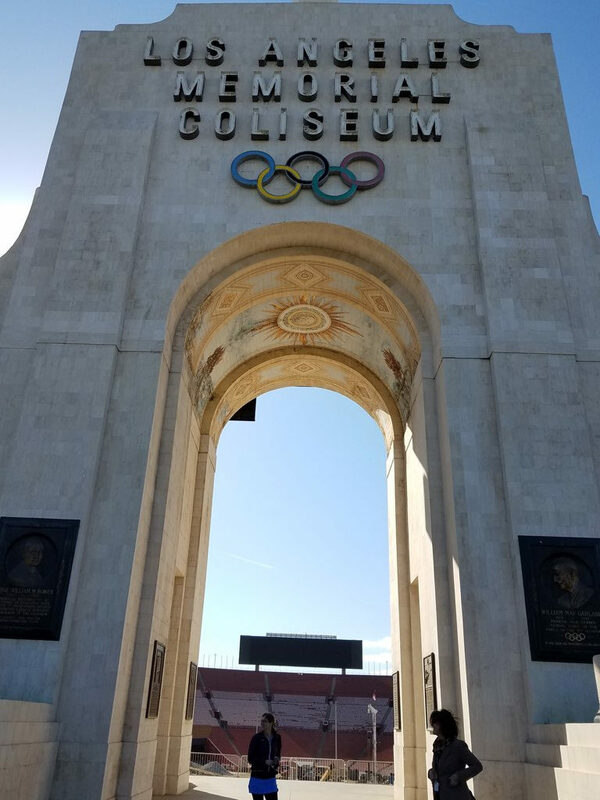 She took us over to the Coliseum under bright skies and cool breezes. This historic place is amazing, despite being under reconstruction. 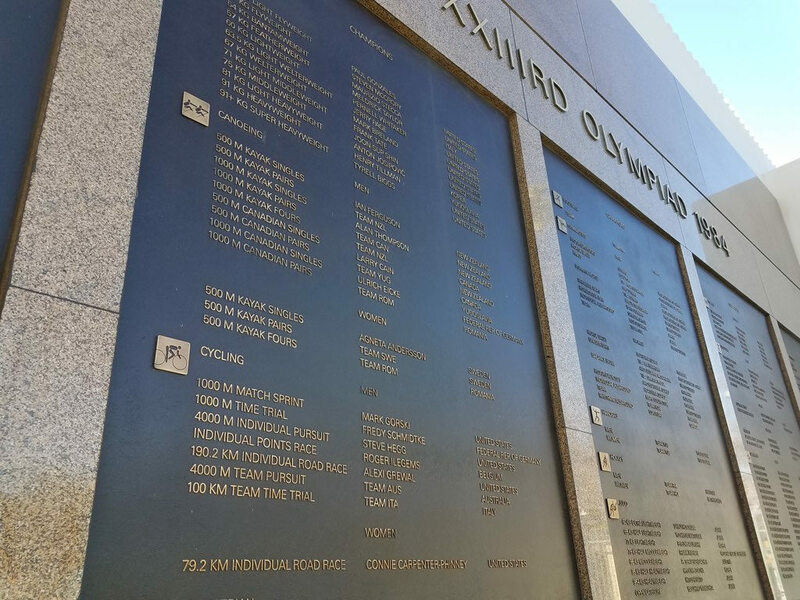 The exterior has a huge plaque detailing the gold medals awarded at the 1984 Olympics, and I carefully looked at the the cycling races. There was just one women’s medal, the road race, won by Connie Carpenter-Phinney. Weary from jet lag, we called it a day and headed back to the hotel. Here’s our Strava track and the day’s photos are here. Distance: 31.9 miles. Our route at Strava is here and our photos are here. First thing was more coffee at Verve on Friday morning. 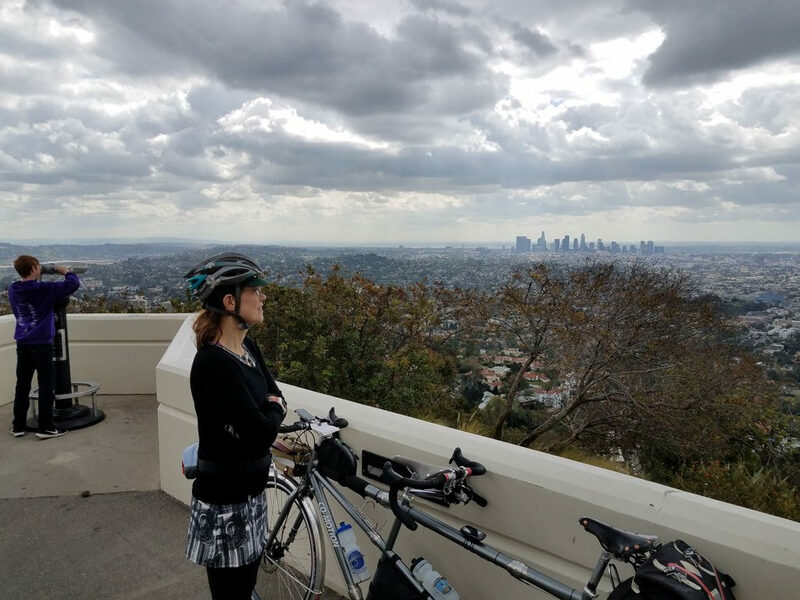 From there we rode northwest up to scenic Griffith Park under partly cloudy skies. The bike needed a decent test and we were itching to look around. With a little planning beforehand, we managed to route ourselves via designated bike routes and got there without any problems. The park was mostly empty, being a weekday. A closed switchbacked service road, a.k.a. Trash Truck Road, leads to Griffith Observatory, which we discovered after we saw a couple of other cyclists head that way around a chained gate. No cars, just scenery. We were in heaven. We even managed to pass those guys – briefly! Up at the top we took photos and walked around. I felt like a real tourist looking over the city with the Hollywood sign in the distance and all the other visitors (who drove their cars) milling around. I had a good feeling wash over me. It wasn’t just the views, either. We were enjoying time together and decent warmth after weeks of cold weather in D.C. The skies were mostly clear of the infamous L.A. smog, and we were on our vacation after months of planning and anticipation. Traveling with the bike and the initial navigation in a new city is always nerve-wracking. Those first moments of relaxation are so welcome. We snagged lunch at a tony Vietnamese place in hipster Silver Lake, where the guys all dress like Leonard Cohen, and stopped for coffee at Intelligentsia Coffee nearby on Sunset Boulevard. We sat outside next to a band planning their upcoming tour. 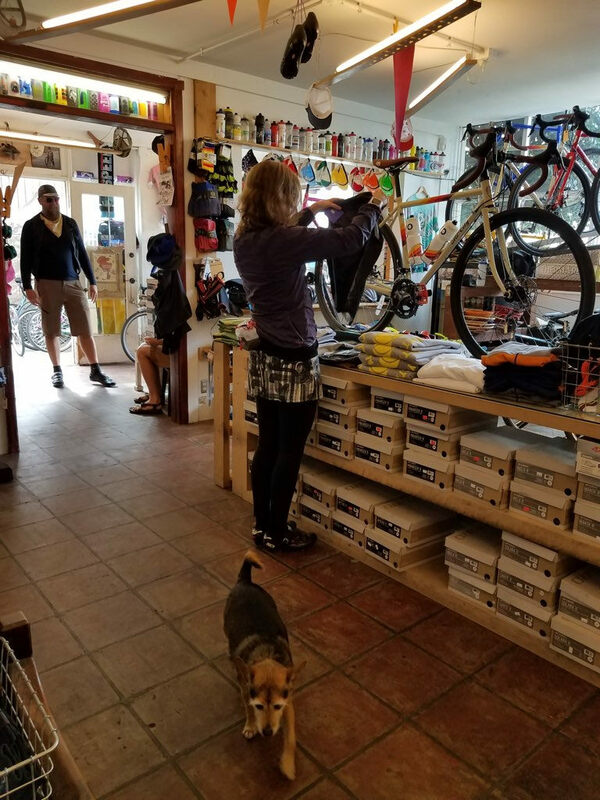 Our final stop was nearby Golden Saddle Cyclery shop, a tiny place that specializes in boutique bikes, parts and duds. We met and exchanged notes with Drew from Flagstaff and the Australian bikepacker duo Jorja and MarDel, a.k.a. the International Kook Exchange, who were in traveling in Arizona and California to get in some miles on their offroad Crust bikes. They handle Crust sales in Sydney. Meeting them was an interesting coincidence regarding the extended Crust family. We became familiar with Crust at the now-closed Gravel & Grind bike and coffee shop in Frederick, Md., where James, now of Analog Cycles, brought Crust to the mid-Atlantic. Turns out Golden Saddle is quite the destination for the L.A. adventure crowd. I got a bottle and some fancy socks and thanked myself for getting out of there without buying a new bike. The Java, by the way, was running without issues, putting another potential source of stress to rest for the time being. Later we met up again with Mary’s sister for a pleasant dinner with her family in Pasadena. The forecast called for rain and the skies finally opened up, but by then we were off the bike. We took Metro and light rail to their place, and on our car to Pasadena was a junkie trio, all glassy-eyed in dirty clothes. Los Angeles, like other western cities we have visited, seems to have its share of addicts, though more out in the open than in D.C. The Los Angeles Times wrote a recent story on the challenges faced by riders, police and social service groups as homeless people flock to the Metro system. See it here. Next up: We make a day of it in L.A. and then hit the road towards Phoenix.